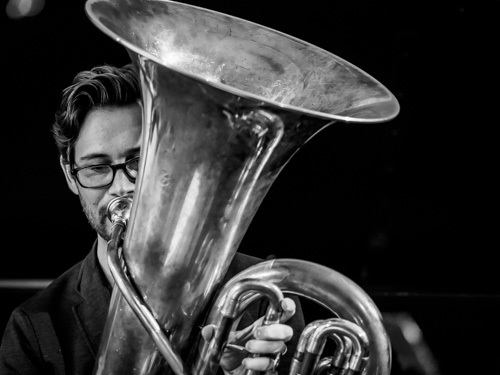 Composer and Tubist, Ben Stapp, although classically trained with Tommy Johnson and Roger Bobo while pursuing his love for jazz tuba, Ben further opened up his horizons while living in Portugal, hanging out at Clean Feed’s record store. Since then he’s been living in New York since 2007 and experienced the diversity of New York’s music scene including engagements with Steven Bernstein’s Universal Melody Brass Band, ICE (International Contemporary Ensemble), toured with Red Barrat, played with the Garden State Philharmonia at Carnegie Hall, with Slavic Soul Party, Mario Pavone’s Accordion Project, playing Earle Brown with the ECCE Ensemble at MIT, frequent traditional jazz and brass band freelancer, Nate Wooley’s Seven Storey Mountain, tubist for the Chelsea Symphony, with TILT at Lincoln Center to Premier John Luther Adam’s Sila, for Eli Yamin’s Blues Band, Sousaphone player for Jacob Sac’s live Heavens Trombone Choir, plays tuba in Stephen Haynes Quintet with Joe Morris, Warren Smith, and William Parker, and dedicated Colombian-music tubist with Martin Vejarano’s Cumbia River Band, Chia’s Dance Party, Pablo Mayor’s Folkore Eurbano, and the experimental Alejandro Florez’ Tin Throat Ensemble. Two years later created a workshop ensemble called the Zozimos, often pulling ideas from his talented players and assembled a quintet recording an album – Return from Panopolis; with Danny Fischer, Justin Wood, David Smith, and Sebastian Noelle with special guests: Amanda Brasher, Isaac Darche, Alex Terrier, Curtis Stewart, and Andy Hunter. As a digital release and possibly hard to digest faux-pop, post-modern aesthetic, it received little press. Antonio Branco from JazzPt however took it on and said it was, “a diverse, vibrant record that seduces the listener with its multiple points of interest, accomplishing several different nuances after repeated plays.” The group and music were 1st place winners the 38th Annual Duke Ellington Jazz Festival – Bob Stewart Tuba Competition. Later that year he was awarded his first large ensemble commission for a completely differently minded ensemble and composition, called 8 houses, which dived into the mysticism of the I-Ching and compositionally a piece using aleatorics, sub-groupings, free-improvisation, note cells, and electronics. It was really a concerto for the incredible duo, Vortex, Satoshi Takeishi and his wife Shoko Nagai. The piece is available on Stapp’s bandcamp page. Further developing the Zozimos Ensemble, Mr. Stapp dedicated his efforts to an opera to consecrate his obsession with Jung and to enfold his most recent harmonic and rhythmic ideas into a detective narrative/ abstracted autobiography. After two years of workshopping music and narrative ideas he finally recorded a two album set entitled, Myrrha’s Red Book released by the now collapsed record label, Evolver. With this piece Stapp was one of the Jerome Foundation’s Emerging Artist Commissions. The full list for that year was: Ben Stapp, Aaron Burnett, David Ruder, Ha-Yang Kim, Leslie Flanigan, Tyshawn Sorey, Mary Kouyoumdjian and M.V.Carbon. Mr. Stapp has recently recorded a duo album with Joe Morris with special guest Stephen Haynes and is looking for a potential music label. Mr. Stapp is also working on a new set of pieces for septet to showcase his newest music theories and particularly his approach to harmony: Theta Scales.